If you like my poetry, I have published two books of poems which can be purchased from this page. ‘A Carrot in the Toaster’ Published in 2009, contains a collection of fifty two poems. 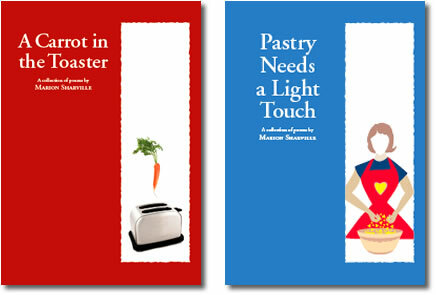 ‘Pastry Needs a Light Touch’ Published in 2010, contains a collection of seventy eight poems. To the UK, including postage and packing: £10 per copy. To the rest of the World, including postage and packing: £12 per copy. You can purchase now by clicking the Buy Now button below. This will open a PayPal payment window. You can pay with credit and debit cards or your PayPal account if you have one. In the PayPal window you can type in which book you want and how many copies. Please also enter the full amount and complete the payment. You will be asked for your postal address. We will then send you a confirmation email and post the book/s to you as quickly as possible. HI Mervin, glad you liked the site. I know John Wayne’s name was Marion but I am more a granny than a son, and a very old granny at that. Sorry to disappoint you. The headline about Wikipedia is out of my sphere. I have to keep things simple. I am based in England.Pperhaps you are from America. Thanks anyway for the comment.